The 1980 United States presidential debates were a series of debates held for the presidential election. The League of Women Voters organized two presidential debates: the first on September 21, 1980, and the second on October 28, 1980. The second presidential debate is the second most-watched debate in American history. The Republican nominee Ronald Reagan participated in both debates. Independent candidate John B. Anderson only participated in the first debate, while the Democratic nominee and incumbent President Jimmy Carter participated in the second debate. The first presidential debate started at 10:00 p.m. EDT and the second presidential debate started at 9:30 p.m. EDT. Both of them ended at 11:00 p.m. EDT. There were no vice presidential debates. The three invitees were Jimmy Carter, John B. Anderson and Ronald Reagan. Carter refused to attend, believing that a three-way debate would have strengthened Anderson's campaign. 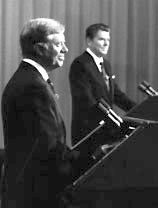 Following a strong performance by Reagan, Anderson's poll numbers began to drop; he would not be invited to the second debate. Anderson and Reagan both received six questions. They were given two and a half minutes to answer each question, as well as one minute and 15 seconds to rebut. Closing statements could be as long as three minutes. Carter and Reagan were the only invitees. CNN attempted to include Anderson from the Constitution Hall in Washington, D.C. CNN's Daniel Schorr read the same questions to Anderson. They then aired Anderson's live responses along with tape delay of Carter and Reagan's responses, despite technical difficulties. Reagan's most notable moments include using the phrase "There you go again" and asking whether or not Americans were better off than they were four years ago. In 1983, Reagan's team came under fire for having access to Carter's internal debate briefing materials. The second presidential debate consisted of two halves, and panelists were only allowed to offer follow-ups in the first half. Candidates Carter and Reagan both received the same 12 questions and the ability to rebut twice for one minute each. Nielsen Media Research states that the second presidential debate garnered 80.6 million viewers. It was the most-watched debate in American history until the first presidential debate of 2016. ^ a b c d e "1980 Debates". Commission on Presidential Debates. Archived from the original on January 20, 2019. Retrieved January 20, 2019. ^ "VP debates often more memorable". USA Today. October 10, 2012. Archived from the original on January 20, 2019. Retrieved January 20, 2019. ^ "The Carter/Reagan Debates". PBS. September 24, 2000. Archived from the original on January 20, 2019. Retrieved January 20, 2019. ^ a b c d "1980 Presidential Debates". CNN. 1996. Archived from the original on January 20, 2019. Retrieved September 25, 2018. ^ "September 21, 1980 Debate Transcript". Commission on Presidential Debates. September 21, 1980. Archived from the original on January 20, 2019. Retrieved January 20, 2019. ^ Shipp, Randy (October 27, 1980). "Anderson to debate, too, via cable-TV network". The Christian Science Monitor. Archived from the original on January 20, 2019. Retrieved January 5, 2019. ^ Schroeder, Alan (June 2016). Presidential Debates: Risky Business on the Campaign Trail. Columbia University Press. p. 263. ISBN 978-0-231-54150-3. ^ Kondracke, Morton (July 17, 1983). "Debategate". The New Republic. Archived from the original on September 19, 2015. Retrieved January 20, 2019. ^ "October 28, 1980 Debate Transcript". Commission on Presidential Debates. October 28, 1980. Archived from the original on January 20, 2019. Retrieved January 20, 2019. ^ "Highest Rated Presidential Debates 1960 To Present". Nielsen. October 6, 2008. Retrieved January 20, 2019. ^ Kennedy, Merrit (September 27, 2016). "Clinton-Trump Showdown Was The Most-Watched Presidential Debate Ever". NPR. Archived from the original on January 20, 2019. Retrieved January 20, 2019. This page was last edited on 24 March 2019, at 05:52 (UTC).